Ahhhh October is upon us. Football is everywhere. The pigskin may be dominating the next few month's but as the leaves fall, we still have a fall classic. That classic takes me back to my youth. Yes, baseball, hot dogs and apple pie will always mean America to me even though these days it is more like football, hamburgers, and frozen coffees. Baseball may not be the national past time but in October, the fall classic still reigns king. I was born in Cincinnati, Ohio in 1963. Something else memorable happened 55 years ago in Cincy. Pete Rose, aka Charley hustle logged the first of his 4256 hits. Yep, Pete Rose was The National League Rookie of The Year in 1963. The memories that Pete gave me still run through my head....Bowling over Ray Fosse to win the 1970 All-Star Game, scrapping with Bud Harrelson in 1973 playoffs, beating out a bunt to continue a hitting streak that lasted 44 games, standing on first base with his hat in the air after breaking Ty Cobb's hit record, and the squatting batting stance. Pete Rose taught me a lot about life. He taught me you didn't have to be the fastest, the strongest, or the smartest to win. He taught me that a man who hustles and tries hard can accomplish almost everything. He taught me that no matter how bad things look do not give up. Charlie Hustle also taught me that if it was worth doing, it was worthing giving it your best attitude. But The Big Red Machine was more than just Number 14. Who could possibly forget Number 5? Yes, the National League Rookie of The Year in 1968.....the greatest catcher of them all....the clutch slugger who out banged Mr October himself (Reggie Jackson) in the 1976 World Series.... no other than Johnny Bench. While Pete Rose was the rough and tough scrappy hometown boy from Cincinnati, Johnny Bench was the big strong country boy from Oklahoma. Rose was the singles guy who beat you one piece at a time, while Bench would crush you with a single swing of the bat. Bench is in The Hall of Fame getting the credit he deserves as being one of the best catchers to ever put on a mitt. Rose is still in the alley at Cooperstown...still banned...signing autographs down the street. Bench and Rose were the main cogs when the Main Spark, Sparky Anderson fired up the Big Red Machine in 1970. JB was behind the plate. Big Lee May was at first. Tommy Helms, Woody woodward, and Tony Perez made up the rest of the infield. Pete Rose, rookie Bernie Carbo, Hal Mc Rae and Bob Tolan - he of the unique batting stance of holding the bat high in the air made up the outfield. Don Gullet, Wayne Simpson, Jim Merritt, Jim Maloney and Gary Nolan were the top arms on the staff. Of course Wayne Granger, Pedro Borbon and Clay Carroll battled out of the bullpen for Captain Hook (Sparky). The Reds fell to Baltimore in the 1970 fall classic. But, the Orioles were stacked with Frank and Brooks Robinson, Boog Powell, Bobby Grich and a phenomal pitching staff of Jim Palmer, Mike Cueller, and Dave Mc Nally. Bob Howsam would make the fateful trade that turned the Reds from contenders to legends. In 1972, he swung a deal that brought in the mighty-mite Joe Morgan to play second base. Morgan brought the Chief with him. The Chief was Caesar Geronimo, a speedy defensive wizard who provided punch toward the end of the line-up. Dave Conception grew in to the starting shortstop role and the Big Red Machine began to roll. The Reds lost to The A's in the World Series in 1972 but the A's were stacked with legends like Reggie Jackson, Sal Bando, Joe Rudi, and Vida Blue. But this was the beginning for The Reds. They had off years in '73 and '74, only to return with magical years in '75 and '76. The Relentess Reds rolled in those two years. The speed of Ken Griffey was placed in right field. With tablesetters like Rose and Griffey leading off, the heart of the order could just knock them in. Morgan hit third and he hit for both average and drive a ball over the fence. When he was on base, he made the opposing teams nervous with his base stealing prowessness. It was George Foster and Dave Conception's emergence as stars that made the mid-70's Reds better than the '72 version. Foster had giant forearms and according to Pete Rose had the strength to hunt bears with his bare hands. His black bat nailed 52 homers in 1977. The Reds were stacked with NL MVP winners. Bench in '70 and '72, Rose in '73, Morgan in '75 and '76, and Foster in '77. The Reds bested the Red Sox in a battle for the ages in '75 and then swept one of the first pure money 'bought'- teams the Yankees in '76. Very few classic lineups have sported 4 MVP winners. Although he never got the MVP award, Tony Perez was the glue that held them together. He was known as The Big Doggy and his clubhouse presence personified teamwork and kept the egos in check. Pitchers like Jack Billingham and Fred Norman were essential but were not powerhouse pitchers as the Reds were led by their great lineup. Truly, one of the greatest lineups in the history of the game, it would be staggering to see how much that lineup would be worth today. The payroll would probably eclipse $300 million if they were signed in today's market. Riverfront Stadium rocked with the Big Red Machine. The Reds fighting down to the wire against the hated Dogers for the NL West crown. Then, the Pirates were usually lurking around for a tough post season battle. The Big Red Machine will always define 70's baseball. 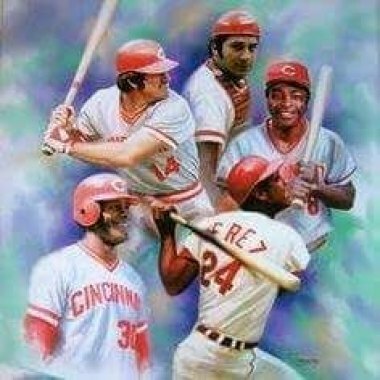 The Big Red Machine will live forever in the hearts of Cincinnati fans. Not only were they loaded with talent, but they had unique personalities to match. Well, it is October. The Reds season has ended. It was a bad year in Cincinnati. The Big Red Machine looked more like The Little Red Wagon. In fact, the classic Reds team with a 73 year-old Rose leading off and getting stuck in his crouch would probably give the younger Reds a run for their money. The Reds will not be playing in the fall classic for a long time but they will always be World Champions in our hearts. Rose may not be in the hallowed Hall but we know he was one of the best to play the game. I will never forget The Big Red Machine and the years they gave a young, skinny boy something to believe inand memories to last a lifetime.